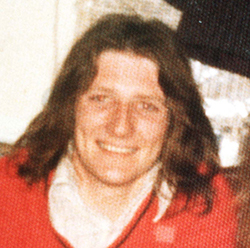 Micky Devine took over as O/C of the INLA blanket men in March when the then O/C, Patsy O’Hara, joined the hunger strike but he retained this leadership post when he joined the hunger strike himself. Hundreds of families – 99% (unemployed) Catholics, because of Derry corporation’s sectarian housing policy – lived, or rather existed, in huts, which were not kept in any decent state of repair by the corporation. After the infamous loyalist attack on civil rights marchers in nearby Burntollet, in January 1969, tension mounted in Derry through 1969 until the August 12th riots, when Orangemen – Apprentice Boys and the RUC – attacked the Bogside, meeting effective resistance, in the ‘Battle of the Bogside’. On two occasions in 1969 Micky ended up at the wrong end of an RUC baton, and consequently in hospital. The already strained relationship between British troops and the nationalist people of Derry steadily deteriorated – reinforced by news from elsewhere, especially Belfast – culminating with the shooting dead by the British army of two unarmed civilians, Seamus Cusack and Desmond Beattie, in July of 1971, and with internment in August. Micky, by this time seventeen years of age, and also politically maturing, had joined the ‘Officials’, also known as the ‘Sticks’. Like others incarcerated within the H-Blocks, suffering daily abuse and inhuman and degrading treatment, Micky realised – soon after he joined the blanket protest – that eventually it would come to a hunger strike, and, for him, the sooner the better. He was determined that when that ultimate step was reached he would be among those to hunger strike. With the 50 % remission available to conforming prisoners, Micky would have been due out of jail next September. Micky died at 7.50 am on Thursday, August 201h, as nationalist voters in Fermanagh/South Tyrone were beginning to make their way to the polling booths to elect Owen Carron, a member of parliament for the constituency, in a demonstration – for the second time in less than five months – of their support for the prisoners’ demands.